After a week of being non-active due to my backpains, I finally hit the road again. I was determined to get back into the groove and especially today as it's Nike+'s Game On, World event. 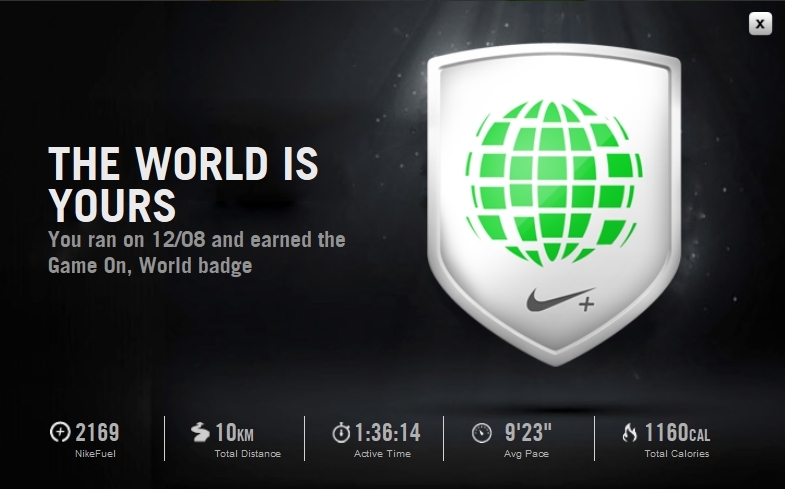 The goal is for the whole Nike+ Community to break the previous June record by earning over 361,293,515 Nikefuel in 24 hours. I think they are going to make it, because 5 hours before closing the counter is already indicating over 338 millions nikefuel. I am gradually increasing the distance of my walks and today I reached the 10K milestone in just over 1,5 hours, burning 1160 kcal along the way. Which obviously made me very happy :o) Just like 10 days ago, I broke every record I established since starting this more active lifestyle. Proof below. Drinks : 2,5L still water.